Home \ AP \ Fish Pass Mirror Test, But Does it Mean They’re Self-aware? Fish Pass Mirror Test, But Does it Mean They’re Self-aware? NEW YORK (AP) — Scientists report that a fish can pass a standard test of recognizing itself in a mirror — and they raise a question about what that means. Does this decades-old test, designed to show self-awareness in animals, really do that? Since the mirror test was introduced in 1970, scientists have found that relatively few animals can pass it. Most humans can by age 18 to 24 months, and so can chimps and orangutans, says the test’s inventor, evolutionary psychologist Gordon Gallup Jr. of Albany College in New York. Outside of ape species, many researchers say there’s also good evidence for passing the test in bottlenose dolphins, Asian elephants and European magpies, although Gallup is skeptical of those results. The test exposes animals to a mirror and looks for reactions that indicate some recognition of themselves. For example, do the animals do unusual things to see if the image copies them? Do they appear to use the mirror to explore their own bodies? And if researchers mark an animal in a place the creature can observe only in the mirror, does the animal try to remove it? Passing the test suggests an animal can “become the object of its own attention,” and if it does, it should be able to use its own experience to infer what others know, want or intend to do, said Gallup, who did not participate in the fish study. The new paper released Thursday by PLOS Biology subjected up to 10 fish to various parts of the test. 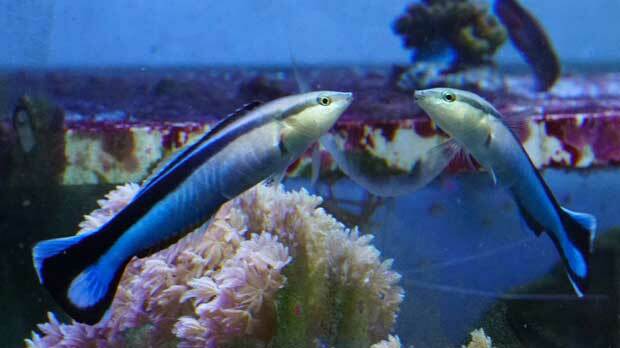 Alex Jordan, who’s at the Max Planck Institute for Ornithology in Konstanz, Germany, and colleagues observed a reef-dwelling species called the cleaner wrasse doing odd behaviors like swimming upside-down by the mirror. When four fish were injected with a tag that left a visible brown mark under their throats, three scraped that part of their bodies against a rock or the sandy bottom of the tank, as if trying to remove it. In all, the researchers concluded that the fish had passed the test. But Jordan says his fish could have succeeded without possessing true self-awareness. They may have matched the reflection to parts of their own bodies, but he said that less-sophisticated mental talent doesn’t require self-awareness, which includes talents like distinguishing their own bodies from those of other fish or recognizing their own territory or possessions. Nor does it imply self-consciousness, which means thinking about oneself and one’s own behavior in relation to how others act, he said in an email. Gallup said he believes the experimental procedure was flawed, so the fish can’t really be said to have passed the test. Frans de Waal, an expert on ape and monkey behavior at Emory University’s Yerkes National Primate Research Center in Atlanta, said he found the fish results to be inconclusive. In a journal commentary, de Waal also said it’s better to think of different animals having varying degrees of self-awareness, rather than considering it an all-or-nothing trait possessed by just a few species. “To explore self-awareness further we should stop looking at responses to the mirror as the litmus test” and turn to other means of evaluation, he said.